Am visiting my son in DC and want to send you a book by my 80 year old mother. It is called gruhini and has been published for 30 yrs…..you might want to review the book or use some recipes if you find them interesting. Kindly send me your postal address by mail so that I can send a copy of the book. Your writing helps a lot of people! Mrs.Hemalatha Parashuram, is Mr.G P Sudhakar’s 80 year old mother. He sent me this book, and also a book on our beloved Rayaru. 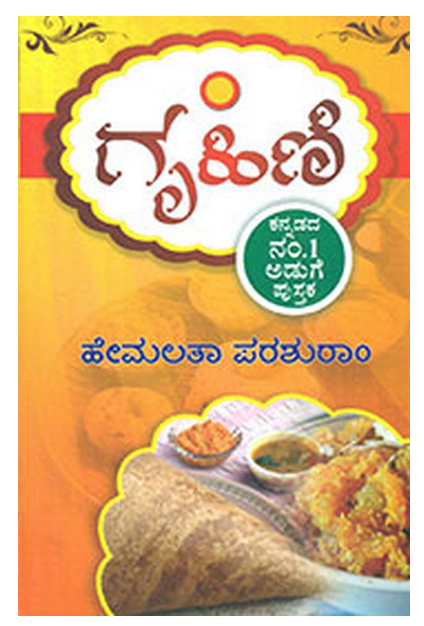 The book Gruhini – ಗೃಹಿಣಿ is written in Kannada. The book is divided into 9 sections or as we call in Kannada ಅಧ್ಯಾಯ. The first section is about marriage and being a a home maker. This one lists all the items you for any social function we perform. For example what we need to bring for an engagement, what items to give for the bride, the groom, people who attend. A nice to have checklist. I am sure it will come very handy whether you are performing a thread ceremony for your son, engagement for your daughter, starting a new life with your spouse. Liked this section very much. The second section is all about festivals. Not very detailed, but again gives you a list of all items you need to buy, how to arrange, for each and every important festival. The third about making juices such as lemon, grape, tomato so on. Mainly focused on the oens which you drink before food. Fourth section is all about food, mainly focused on lunch and dinner items such as soups, vegetables, sambar, rasam, chatni, sweet dishes. I haven’t tried any of them as of now, but will definitely post recipes as and when I prepare them. Breakfast, evening snack, sweet and spicy dishes are covered in the 5th section. Section 6 is again drinks and jams, and section 7 is international food such as breads, bun, muffin, cake, biscuits, ice cream and fruit salads. Interesting to try and find out how they turn. As you have seen, I am not a baker. Section 8 is mostly health related tips and tricks. And finally the last section is about how to stay happy. I skipped most of the food preparation pages and read these few pages. Couldn’t stop laughing reading a few stories about unhappy wives. The author does give a few nice tips and tricks to be happily married ever after. Only if men and women read this and actually work towards a happy married life. As much time as I had skimming the book, it was interesting. I would once again thank Mr.G P Sudhakar for sending me this book. Thanks, Sir and my Namaskaras to your Mother. Please convey to her my hearty congratulations for a great book she has shared with me and the community. Today through the post I received a very valuable gift from Shri. Canchi Ravi. I have no words to express my happiness as I opened the package. 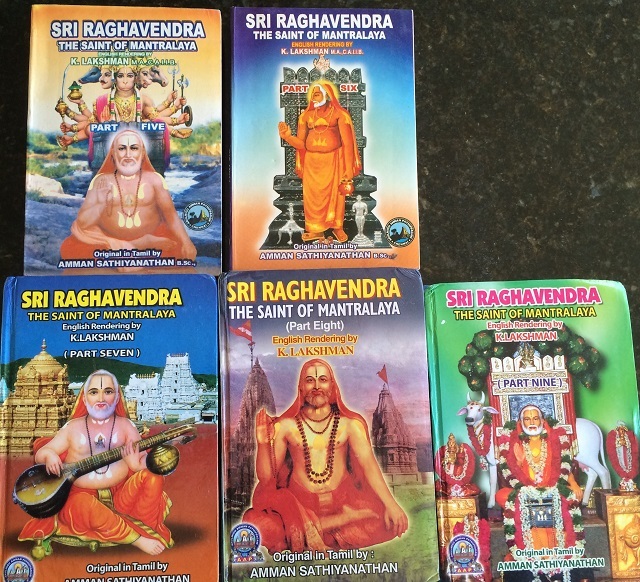 It is the amazing set of 9 books on our Beloved Rayaru. As mentioned here earlier by Shri. Canchi Ravi, the original series written in Tamil is by Amman Sathiyanathan. And the English translation by K. Lakshman. It is really a gift for me from our Beloved Rayaru was what my Father told me when I informed him about this. For Shri. Canchi Ravi to send it to me all the way from India, and costing several thousand rupees is just really a miracle. I truly believe it is Rayaru who wants me to spread the message and his miracles through this blog and hence gave the thought to Shri. Canchi Ravi to send it to me. I have received several gifts in my life but none as precious as this one. It has brought immense joy to me. I know my beloved Rayaru has blessed me. Each of these books has close to 500 pages. I am hoping to complete 1 book every month. And as I read the same, I will post snippets and quotes from the book to share the miracles of our Beloved Rayaru. I really have no words I can see fit in the English or for that matter any dictionary to thank Shri. Canchi Ravi. Sir, my shanstanga namaskaras to you. And as and when I finish each book in the series, I will share it with other people to read as well. Received this amazing book from Shri. Sethu Rao. Thanks sir for such a wonderful gift. There is no words to express my gratitude. To receive a book on our Beloved Rayaru, which came to me on a Thursday, is a great sign from Rayaru. I pray to our beloved Rayaru to help him and his Mandali complete many more Ashtotras and reach greater heights. Hopefully, during one of my visits to India, I will be able to take part in one of these programs and get blessings from our Beloved Rayaru. Madhvacharya’s Lineage “GURU CHARITE” is written by Dr. H.K Vedavyasacharya http://www.srsmutt.org. I was sent the pdf of this document by Mr. Shivprasad Dinkar. Thanks so much for providing such a great document. During my travel to India, I read this document several times. 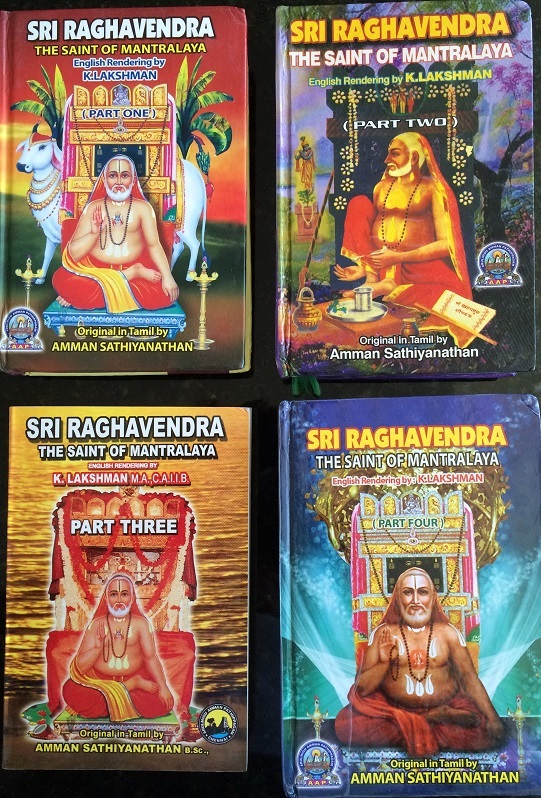 It has detailed information about all the great saints from our Acharaya Sri Madhvacharya, to our beloved Guru Sri Raghavendra Swamy and also other saints like Sri Vadeendra Thertharu, Sri Sushameendra Theertharu to the current Guru of Sri Raghavendra Swamy Mutt. I had tears rolling my eyes while reading through the miracles of Sri Raghavendra Swamy, and also the places he visited. This is a treasure document if you want to learn and know more about all the great saints/Gurus. The document also has songs and slokas, books written by these saints and the places they visited. All credit of this document goes to the author Dr. H.K Vedavyasacharya and SRS MUTT. I am just providing the pdf to help people know about the great Gurus. Below is the link to download the document. Mr. Srinidhi has shared the PDF documents for ಶ್ರೀ ಹರಿ ಕಥಾಮೃತ ಸಾರ – Sri Hari Kathamruta Sara Lyrics in Kannada and English. Thanks so much Mr. Srinidhi. Please use the link below to download the same. What an amazing composition by our Kanaka Dasaru. As you listen to the audio and video, bhakthi and devotion will overflow. Just so amazing. I just talked to my Dad, and he said he has this Hari Bhakthi Sara memorized. So, proud to be his daughter. You can find the lyrics in Kannada in PDF form in the below link. Can you please post to the group saying that we would like to give away 20 sets of the attached books. I live in Bangalore – Vijayanagar and interested people can collect it from me for free. I would prefer to give on a first come first serve basis. We are not limiting to 1 copy per person or something. If they want to pick up more for free for their friends too thats fine too.